Since coming together in 2016 Hexagonal have become a major force on the thriving British jazz scene. On International Jazz Day earlier this year, for instance, they played the legendary 606 Club in Chelsea, which formally described them as a ‘jazz super group’. Other highlights of the past year included gigs at the Scarborough Jazz Festival and the Herts Jazz Festival, where their live performance was recorded and played back over an hour on Soweto Kinch’s Jazz Now programme on BBC Radio 3. They have also recently played at another leading London jazz venue, the Pizza Express in Dean Street. But they still manage to play occasionally in Hastings, most notably at the FILO pub in the Old Town, where they began life as the FILO All Stars. This Friday it’s the turn of the Kino-Teatr. 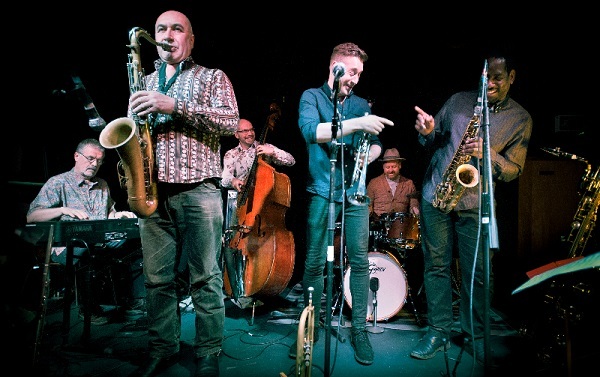 The band consists of Jason Yarde on alto sax, Greg Heath on tenor sax and flute, Graham Flowers on trumpet, John Donaldson on piano, Simon Thorpe on bass and Tristan Banks on drums. 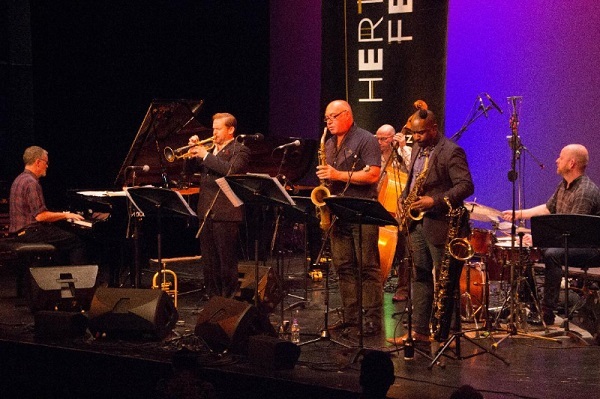 The six initially got together to play the music of the late great South African composer and multi-instrumentalist Bheki Mseleku, with whom John Donaldson and Simon Thorpe toured a decade or so ago. To expand their repertoire they added compositions by the renowned pianist McCoy Tyner, with whom Jason Yarde has played. That’s why Hexagonal’s debut album, which came out in September, was titled McCoy and Mseleku. The band will be playing tracks from that album at the Kino-Teatr on Friday, along with original compositions by band members. Hexagonal Kino-Teatr, 43-49 Norman Rd, Hastings, Saint Leonards-on-Sea TN38 0EG, Friday 7 December, 7.30pm. Admission £12 plus booking fee. The band at the Herts Jazz Festival.